Ammonittøya is a small island in Brepollen (innermost Hornsund). The name points towards fossils (ammonites) discovered here. The ammonites are found in moraine sediments covering most of the island, which was glacier-covered until the glaciers receded in the early 20th century. The rocks containing the fossils were brought by glaciers from anywhere in the catchment area of the glaciers. 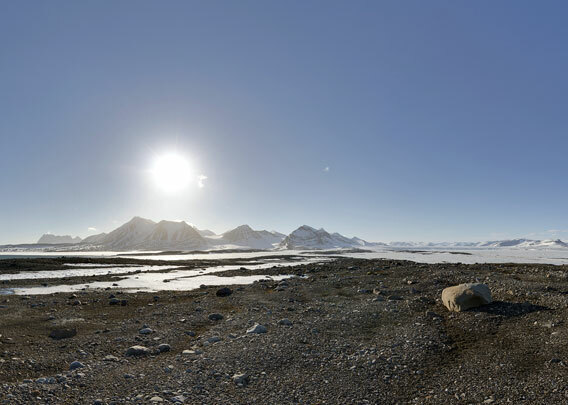 This includes large areas around Brepollen with sedimentary bedrock dating into the Jurassic and Cretaceous (and Tertiary, but this does not contain ammonites in Spitsbergen). Wherever the ammonites exactly came from, they certainly enjoy brilliant views over Brepollen these days and more or less regular visits from polar bears. The bay Brepollen is the innermost part of Hornsund. Now a wide-open bay surrounded by glaciers and moraine peninsula, it did not even exist in the early 20th century! It came into existence as glaciers were retreating during the 20th century.